All I can think about those days is food! I think it’s the weather… The cold weather makes me love being all cozed up inside, eating something yummy. 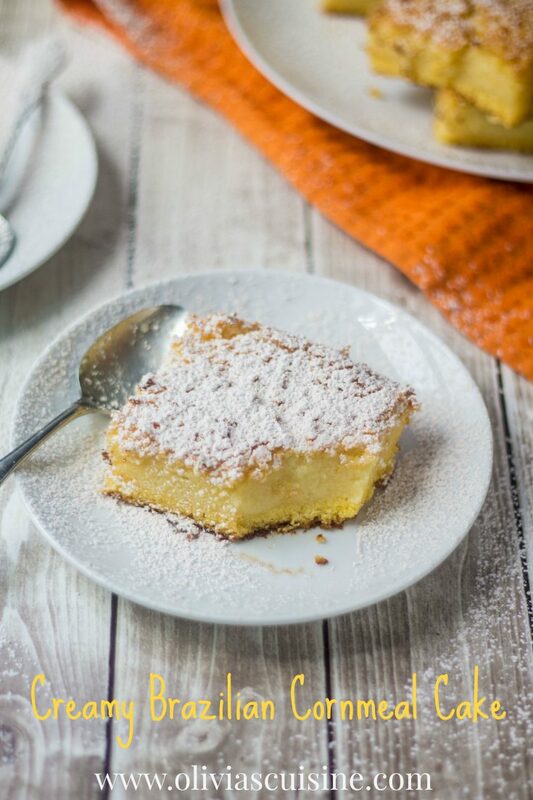 Like this Creamy Brazilian Cornmeal Cake! Hmmmm, there’s seriously nothing better right now. In Brazil this cake (bolo de fubá) is really popular for breakfast or for the “afternoon coffee”. Instead of the British afternoon tea, we have afternoon coffee! :) I’m sure you know coffee is a big deal in Brazil and is consumed after every meal (yes, even dinner!) and during the “cafézinho da tarde” (afternoon coffee), when it is served along pastries, breads and cakes. God, how I miss those… There’s nothing like Brazilian coffee! 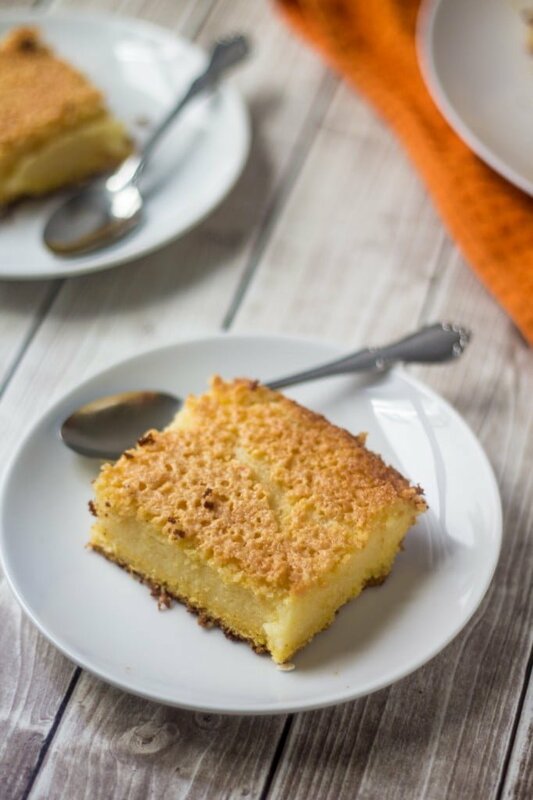 The cornmeal cake is a typical dish from Minas Gerais, but I it was first created by the Africans! The Brazilian slaves, coming from Africa, brought it (and all other dishes that derived from corn) to the Brazilian cuisine. In fact, the word “fubá” is actually an African word that means “flour”. This flour is what we know here in the US as cornmeal and is obtained by grinding dry raw corn. 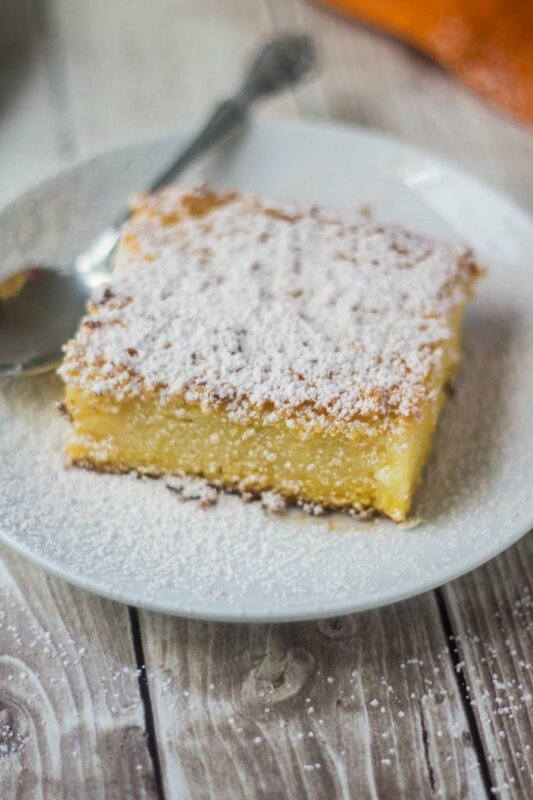 There are lots of different recipes for bolo de fubá, but the one I’m sharing with you today is the one that asks for parmesan cheese and sweet condensed milk. Maybe in the future I’ll share other recipes for this delicious cake! This cake tastes similar to cornbread but sweeter, creamier and cheesier! You take a bite and it melts in your mouth, tickling your taste buds. I especially like to eat it while it’s still warm… but lots of people prefer it at room temperature or even cold. The best thing about this recipe – other than it being amazingly delicious – is that it is made in the blender. Seriously… you just put all the ingredients in the blender and that’s it! Your cake will be in the oven in 5 minutes or less! Add all the ingredients, with the exception of the baking powder, to the blender and blend for a few minutes until everything is combined. Add the baking powder and blend again for 5 more minutes. Transfer the dough to a greased and floured 9X13 cake pan and bring it to the oven for about 40-45 minutes or until a tooth pick inserted in the cake comes out clean. If you want, sprinkle some confectioner sugar mixed with cinnamon on top of your cake. I’ve never had cornmeal cake before, Olivia! This looks fantastic! And I love that you can make it in a blender, too. This is a perfect treat for a cold day. Pinned! Woah awesome! just put everything together in a blender – that has to be my favorite part of the recipe. :D I hate doing the dishes and cleaning my kitchen, so annoying! anyway coming to the cake, it looks delicious Olivia and something I haven’t tried before. Would love to make this one day, thanks for the recipe! :) Pinned. This cake looks simple but delicious! It’s perfect for breakfast with a cup of coffee! Yum! You had me at blender…well, no, you had me before that, but you locked me in at blender! This looks really scrumptious! And I love the idea of ‘afternoon coffee’! Nice post, Olivia! This cake sounds delish, Olivia! 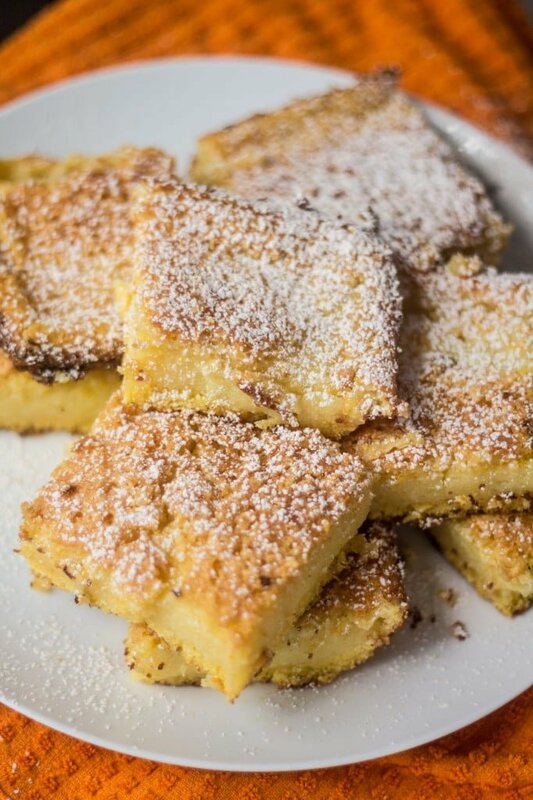 Love baking polenta cakes! I’m yet to try Brazilian cuisine, and I’m told the desserts are amazing. This certainly sways me! I’ve never had cornmeal cake! Can’t wait to try it. It looks just delicious! i followed the recipe (havent baked it yet) and am concerned. it looks like a drink not a cake. its very thin! Can you believe I’ve never heard of cornmeal cake? It looks so lovely and absolutely perfect for a coffee companion! Thank you, dear! Have fun in Brazil for me! I want to make this for company tomorrow…what size pan is this recipe for? It just says baking pan. This looks beyond amazing, I’ve been experimenting with cornmeal cakes and this looks like it could be my favorite yet. I am wondering what size pan to use also. 9×13…8×8? Fresh grated parmigiano or the dry packaged Kraft variety parmesan? It’s always best to use fresh, but you could use the packaged one in a pinch! Made this today and it was a success! I thought I’d absolutely messed up as the mix is really liquid, but some scientific magic happens in the oven and you end up with a cake-come-custard-tart with the delicious saltiness of the Parmesan. Thanks for the recipe! Did anyone ever figure out which size pan to use? Has anyone actually made this cake? How was it? I have made this cake numerous times since first trying it for the opening ceremony of the Olympics. I used a jellyroll pan. I have not idea if that was correct. Her picture of the cake looks like a 9×13 pan may have been used. I like the jellyroll. The cake is thin, but creamy. I did not add powder sugar because we ate it with our dinner. Very yummy! The mix is very liquidy, but bakes well. I bake mine from 35-40 minutes. Good luck! This is a really great dessert if you’re looking for something that’s not as sweet as your average frosted cake. The batter is more runny than you might expect, but it sets up nicely once it’s baked. I used a 9″x13″ pan. One thing – I didn’t mix quite as long as the recipe states, and it turned out fine. Really, really good! I would definitely make this again. Was looking for a cornmeal cake recipe & stumbles upon this one, I’m so glad I did! It was the easiest cake I’ve ever made and tasted actually delicious. The magic that happens in baking that creates the separation of cornmeal cake and the creamy center looks fancier than the work put into it! I used A round cake pan and it came out looking so pretty, I wish I could attach a picture to this comment. I definitely recommend actually making this cake as most comments seemed to just be pins, enjoy! Thanks for the recipe, I look forward to making this again. Hey! Just tried the Recipe and it turned out wrong. It separated so the cornmeal sunk to the bottom and didnt mix with the Custard part so i had one bland layer of cornmeal sns the upper part was just sweet eggs. What happened? I am in the middle of baking this corn bread…I am excited bringing it to Thanksgiving dinner tomorrow if it turns out! Obrigada! Muchas gracias!